When you create logical drives in the Sun StorageTek RAID Manager software, you can assign a RAID level to protect your data. Each RAID level offers a unique combination of performance and redundancy. RAID levels also vary by the number of disk drives they support. This chapter provides a comparison of all the RAID levels supported by the Sun StorageTek RAID Manager software, and provides a basic overview of each to help you select the best level of protection for your storage system. Use this table to select the RAID levels that are most appropriate for the logical drives on your storage space, based on the number of available disk drives and your requirements for performance and reliability. Disk drive usage, read performance, and write performance depend on the number of drives in the logical drive. In general, the more drives, the better the performance. More information about each RAID level is available beginning with Nonredundant Logical Drives (RAID 0). A drive segment is a disk drive or portion of a disk drive that is used to create a logical drive. 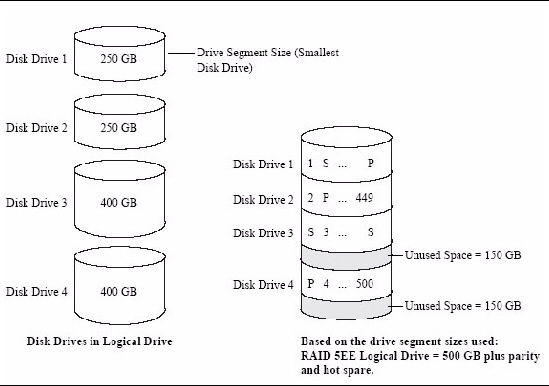 A disk drive can include both RAID segments (segments that are part of a logical drive) and available segments. Each segment can be part of only one logical drive at a time. If a disk drive is not part of any logical drive, the entire disk is an available segment. A logical drive with RAID 0 includes two or more disk drives and provides data striping, where data is distributed evenly across the disk drives in equal-sized sections. However, RAID 0 arrays do not maintain redundant data, so they offer no data protection. Compared to an equal-sized group of independent disks, a RAID 0 array provides improved I/O performance. Drive segment size is limited to the size of the smallest disk drive in the logical drive. 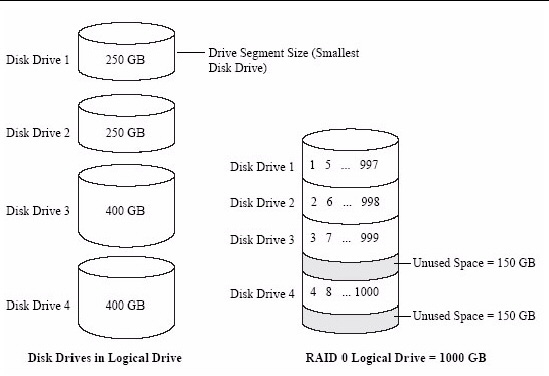 For instance, a logical drive with two 250 GB disk drives and two 400 GB disk drives can create a RAID 0 drive segment of 250 GB, for a total of 1000 GB for the volume, as shown in this figure. A RAID 1 logical drive is built from two disk drives, where one disk drive is a mirror of the other (the same data is stored on each disk drive). Compared to independent disk drives, RAID 1 logical drives provide improved performance, with twice the read rate and an equal write rate of single disks. However, capacity is only 50 percent of independent disk drives. If the RAID 1 logical drive is built from different-sized disk drives, drive segment size is the size of the smaller disk drive, as shown in this figure. A RAID 1 Enhanced (RAID 1E) logical drive--also referred to as a striped mirror--is similar to a RAID 1 logical drive except that data is both mirrored and striped, and more disk drives can be included. 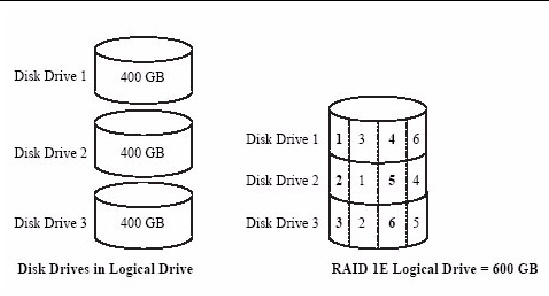 A RAID 1E logical drive can be built from three or more disk drives. In this figure, the large bold numbers represent the striped data, and the smaller, non-bold numbers represent the mirrored data stripes. A RAID 10 logical drive is built from two or more equal-sized RAID 1 logical drives. 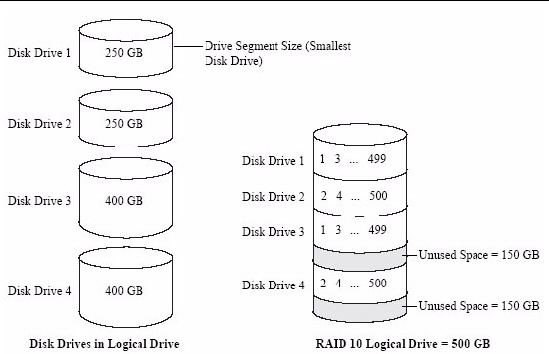 Data in a RAID 10 logical drive is both striped and mirrored. Mirroring provides data protection, and striping improves performance. Drive segment size is limited to the size of the smallest disk drive in the logical drive. For instance, a logical drive with two 250 GB disk drives and two 400 GB disk drives can create two mirrored drive segments of 250 GB, for a total of 500 GB for the logical drive, as shown in this figure. A RAID 5 logical drive is built from a minimum of three disk drives, and uses data striping and parity data to provide redundancy. Parity data provides data protection, and striping improves performance. Parity data is an error-correcting redundancy that’s used to re-create data if a disk drive fails. In RAID 5 logical drives, parity data (represented by Ps in the next figure) is striped evenly across the disk drives with the stored data. Drive segment size is limited to the size of the smallest disk drive in the logical drive. For instance, a logical drive with two 250 GB disk drives and two 400 GB disk drives can contain 750 GB of stored data and 250 GB of parity data, as shown in this figure. A RAID 5EE logical drive--also referred to as a hot space--is similar to a RAID 5 logical drive except that it includes a distributed spare drive and must be built from a minimum of four disk drives. Unlike a hot-spare (see Working With Hot-Spares), a distributed spare is striped evenly across the disk drives with the stored data and parity data, and cannot be shared with other logical disk drives. A distributed spare improves the speed at which the logical drive is rebuilt following a disk drive failure. A RAID 5EE logical drive protects your data and increases read and write speeds. However, capacity is reduced by two disk drives’ worth of space, which is for parity data and spare data. In this example, S represents the distributed spare, P represents the distributed parity data. The parity data provides data protection, and striping improves performance. RAID 50 logical drives also provide high data transfer speeds. Drive segment size is limited to the size of the smallest disk drive in the logical drive. For example, three 250 GB disk drives and three 400 GB disk drives comprise two equal-sized RAID 5 logical drives with 500 GB of stored data and 250 GB of parity data. 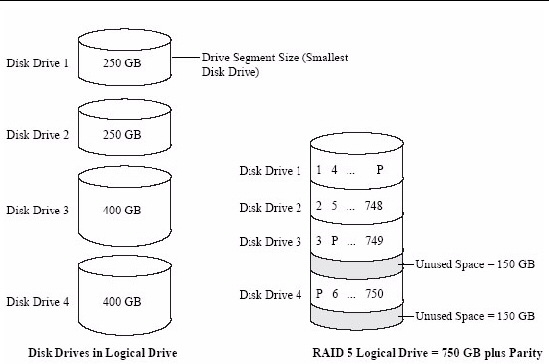 The RAID 50 logical drive can therefore contain 1000 GB (2 x 500 GB) of stored data and 500 GB of parity data. In this example, P represents the distributed parity data. A RAID 6 logical drive--also referred to as dual drive failure protection--is similar to a RAID 5 logical drive because it uses data striping and parity data to provide redundancy. 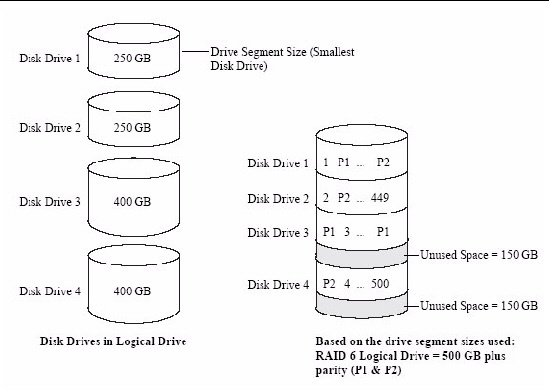 However, RAID 6 logical drives include two independent sets of parity data instead of one. Both sets of parity data are striped separately across all disk drives in the logical drive. RAID 6 logical drives provide extra protection for your data because they can recover from two simultaneous disk drive failures. However, the extra parity calculation slows performance (compared to RAID 5 logical drives). RAID 6 logical drives must be built from at least four disk drives. Maximum stripe size depends on the number of disk drives in the logical drive. Similar to a RAID 50 logical drive (see RAID 50 Logical Drives), a RAID 60 logical drive--also referred to as dual drive failure protection-- is built from at least eight disk drives configured as two or more RAID 6 logical drives, and stripes stored data and two sets of parity data across all disk drives in both RAID 6 logical drives. Two sets of parity data provide enhanced data protection, and striping improves performance. RAID 60 logical drives also provide high data transfer speeds.